By D. Eze - September 2014. Awa Kenzo was born the first son of Sato Denaemon and wife Shun on April 4, 1880 in the village Yokawa (now known as Kawakita-machi) in the northern part of the Miyagi Prefecture. This family was middle class by the standards of the day, as they own a factory that produced materials used in the production of sake and soy based foods. They also owned land and had tenants who rented the land from them. Though the first son, Awa Kenzo was not the first child as an older sister preceded him. The also had 4 younger siblings including 1 girl and 3 boys. Although it is not known exactly why, Awa Kenzo forwent the usual obligations of a first son and moved to the port city of Ishinomaki in 1899 where he eventually met and married his seventeen-year-old wife Awa Fusa. There he began to practice Kyujutsu, the art of Japanese archery. Unfortunately he and his family suffered a setback when much of the city burned down forcing Kenzo to start again in Sendai in the Miyagi Prefecture. Here he continued his studies of the martial arts with Honda Toshizane and began to become renowned all over Japan for this martial arts skills. 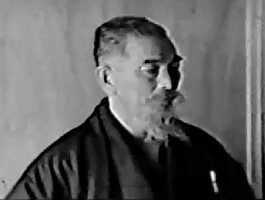 Soon he began to teach and by 1918 he opened a new dojo in Sendai. This is where his philosophical perspective on archery began to be manifested. 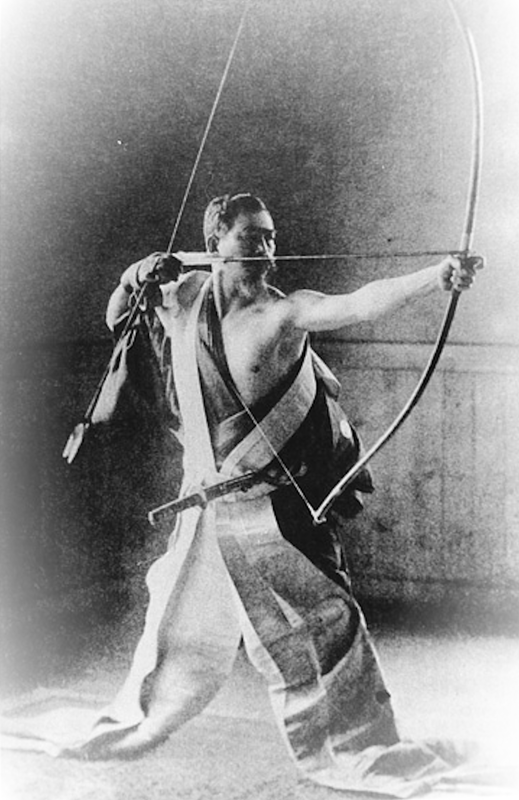 Although Kenzo spent many years perfecting the technical aspects of his archery, it was not until 1918 that he began to look at archery in a different more philosophical way. He noted in his journal that he had finally begun to understand what archery really meant and the real way to shoot. He took on monikers such as Musen (“No Arrow”), Mugen (“No-bowstring”) and Mukyu (“No Bow”) to reflect the deeper understanding he had attained. Trust in the practice of the Way of the Bow. Archery is not an art, it is a Way. Forging your spirit is to become empty, and to focus on your centre. To become empty is to become one with the divine – this is the Way. To attain the Way is to manifest the Way. The Way of the Bow is to manifest your self Buddha-nature and arrive at the ultimate (Stevens, 2007, p. 13). Kenzo talks about archery as not just a fun activity nor is it a hobby that requires frequent practice. It is a way of life that must be lived in every moment whether one has a bow in one’s hand or not. Also, archery was meant to be a spiritual event that allowed for a person to connect to their inner self. The archer is to focus on the act of shooting and leave all the trappings of everyday life behind. Kenzo’s teaching style often left his students unsettled. He is famous for startling students with his booming voice and for his stoic supervision. Unlike the other teachers of his time Kenzo was not interested in form per se. He was more interested in how his students were breathing when they were shooting or how the attitude his students had when shooting. For Kenzo, your psychological state (your spiritual/psychological connection to your body or your mindset when you shoot) is just as important your physical state (where you are aiming and if your are using a consistent anchor point). Kenzo’s teaching advocated for the archer to be centred in all ways and told his pupils to be moderate in every aspect of their lives. He said that archer should neither be elated when they hit the target nor upset then they miss. His teachings also include the notion of enlightenment, which in turn occurs in one of two ways. Kenzo became gravely ill in 1929 when he developed kidney disease and chose to use deep-breathing exercises to cure himself. He did not die but never returned to his full vigor and health. Despite this he continued to teach and practice. In 1938, he fell gravely ill again, this time had to remain bedridden. After, 5 more years of illness Kenzo died in 1939 at the age of sixty. Note - Awa Kenzo is considered to be one of the three greatest archers of the last century. The other two being Howard Hill and Byron Ferguson. Stevens, John (2007). 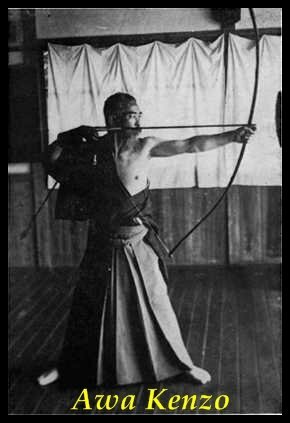 Zen Bow, Zen Arrow: The Life and Teachings of Awa Kenzo, The Archery Master from Zen in the Art of Archery. Boston: Shambhala Publications , Inc.